Oh thank you for getting my room all set up and pretty! I cant wait to move in! lol. Honestly though, this is gorgeous! I want a space just like this, its so cozy and cute. You did a wonderful job. The pillow case is THE best. I love the lighting in your bedroom! 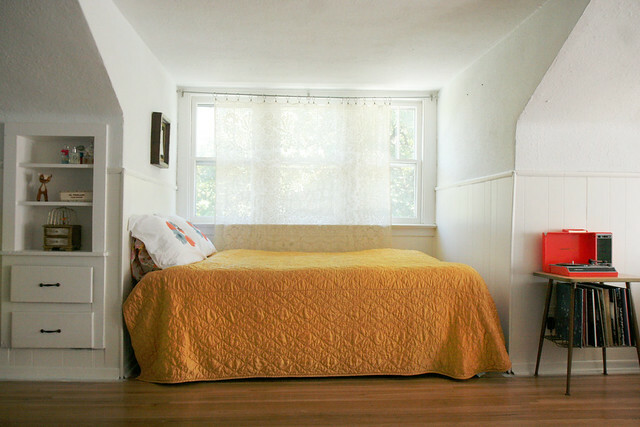 It gives your room such a warm and cozy feel! Also I really like the colors you picked!! Ohhh I love love love this! 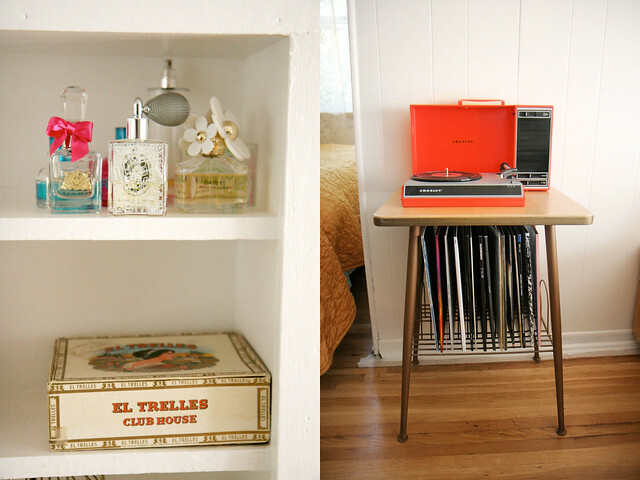 I'm dying for a little table for the record player. This is so perfect - where did you find it? There one in Urban Outfitters but its like £90 :/. Just keep looking! We got this one for $1 at a church yard sale! 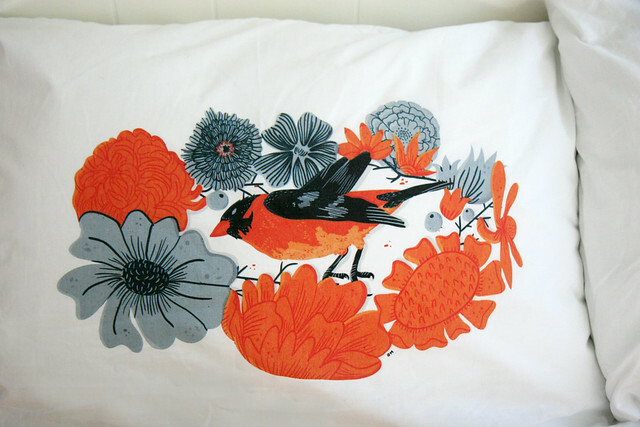 Beautiful pillowcases! I need a pair! 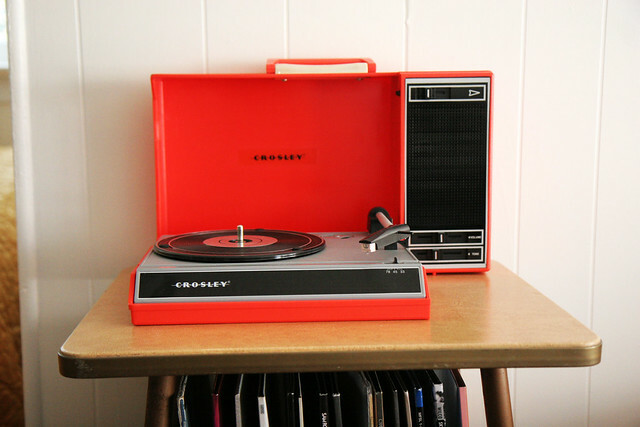 I also love that sweet record player! Oh my, these cushions are so very pretty!!! What a gorgeous, sunny room! Your pillow choice was absolutely spot on. Katie that nook reminded me of "Moonrise Kingdom" the second I saw it. Love it! Katie - Do you remember where you got the quilt / cover? I've been looking for something that shade of orange that isn't overly busy, and the one you have is beautiful. i really love the player there..soo beautiful! Well now your bedroom matches your hair. I just love that warm redish orange with grey black and white. Perfection! Love the minimalism of this room! GORGEOUS. 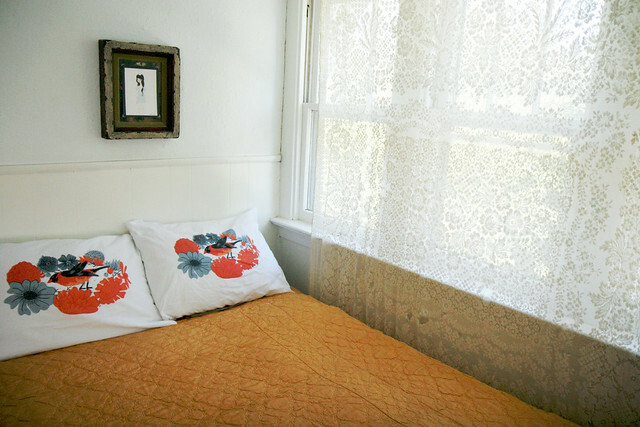 They are beautiful pillow cases and look really good with your decor! gorgeous space! i considered buying that spinerette record player. how's the sound quality on those? what a gorgeous cozy little corner!